Healthcare is complex and the challenges we face on a daily basis are often longstanding and difficult to solve. 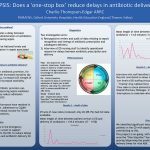 They’re what Mary Dixon-Woods refers to as ‘big hairy problems: the type that require many different interventions being made in some or many different parts of our service, whether this is how we deliver direct patient care, how we support its delivery, how we commission its delivery. 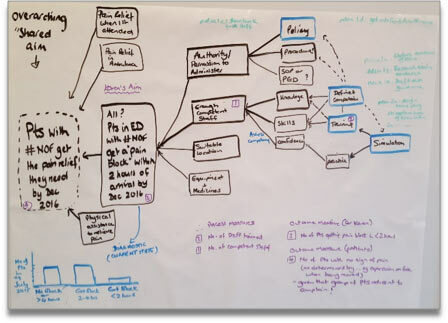 Our trainees are often ‘assigned’ problems like this to ‘sort out’ whilst they are learning to use quality improvement methods and, because they are ‘too big and hairy’ our first task is to help them identify some aspect of the problem that they can make a start on. And this is just the situation Karen Chivers faced when she took up a new placement as a Trainee Consultant Practitioner in a busy Emergency Department. 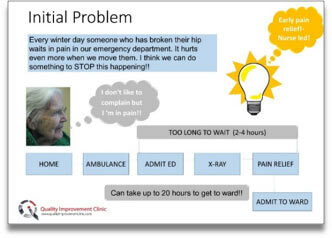 Sorting out pain relief for patients may sound simple, but doing this for someone with frailty who has fractured their hip and is waiting in a busy Emergency Department in Winter is a challenge in itself. 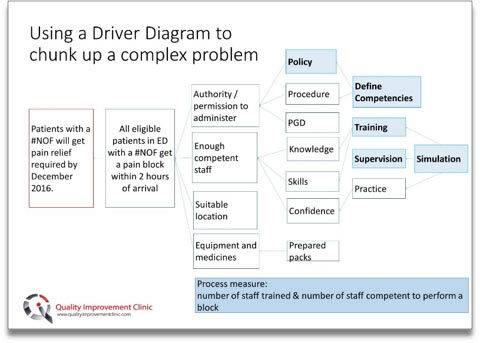 Add to this the pressure of meeting the A&E target, the need to move the patient to x-ray and back before admission, and the fact that the team that had recently been brought together from two different locations added many more layers of complexity. 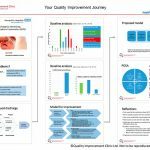 It was clear that Karen needed to identify an aim for pain relief that was within reach of her and her team in the Emergency Department. 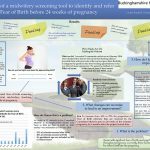 To do this she firstly needed to acknowledge and exclude things that were outside of their control such as pain relief or physical assistance given by a doctor or paramedic before admission. Secondly she needed to establish an aim for patients that staff in her unit would aspire to and sign up to. 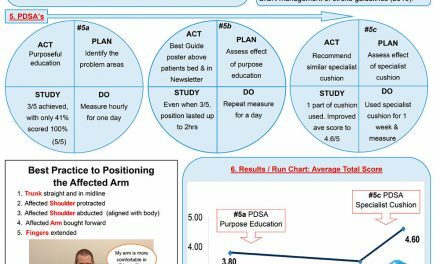 After creating a process map and collecting some initial diagnostic measurements she decided that a reasonable aim would be ‘to establish a pain block within 2 hours of admission to the Emergency Department’. Authority to administer a pain block. By doing this is became clear that the first two drivers had their own set of dependencies. Authority to administer the block had not been established with the new combined team: A new policy was required, procedures needed to be agreed, and alternative approaches such as Patient Group Directions would need to be considered. 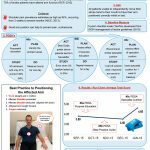 They also required sufficient staff in the new combined team with the knowledge, skills and confidence to give pain blocks in the way that was agreed – and of course this then highlighted some more dependencies: the need to define and assess competency, provide training and the opportunity to practice, possibly via simulation. Faced with such a diagram, you may think that Karen felt overwhelmed. But this was not the case…. Instead she could see the size of the challenge, and work out which pieces she might be in a good position to influence, and which pieces she would have to escalate. 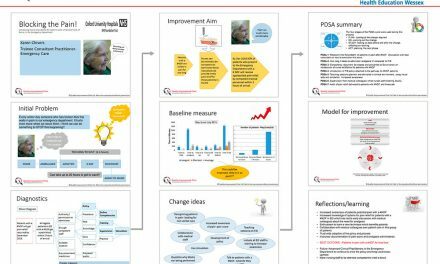 Another benefit of using a driver diagram is that it helped Karen identify places in the change process where she could use measurement for improvement to quickly establish whether or not she was making progress. In this instance Karen chose to use the number of staff trained and the number of staff competent to perform the pain block. An outcome measure would of course be the number of patients receiving pain block within 2 hours, but this takes time – and so getting early sight of the process measure gave Karen confidence that she was making progress towards her goal. Whilst addressing these specific challenges may not be enough to guarantee meeting the aim on a regular and sustained basis, using this method allowed Karen to establish actions necessary to get the desired effect. She could also see why these types of diagrams are also known as ‘action effect mode diagrams’ – and read the literature to understand the concept and technique more deeply. 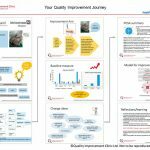 Karen appreciates how working with Quality Improvement Clinic has instilled confidence and belief in using quality improvement methods. NextDon’t handicap your players – deploy them to their positions of strength!